Although the perception surrounding licensed games based on children's properties is not one to be envied, the Adventure Time series has actually done a pretty good job of staying both faithful to the IP and interesting as video games, despite trying a different genre with almost every new release. 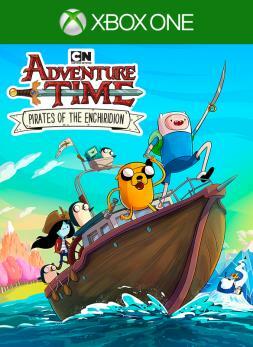 The latest foray into games starring Finn and Jake is Adventure Time: Pirates of the Enchiridion. The buccaneering story feels worthy of the show's typically bizarre scripts, and the turn-based combat serves as a great introduction to the genre for younger fans. Unfortunately, the game is so easy that it leaves behind the many older fans of the property. With a new Adventure Time game comes a new genre, and this time it's a semi-open world turn-based RPG. Beginning as just Finn and Jake before later recruiting Marceline and BMO to your party, players will trek across the flooded land of Ooo fighting pirates and other villains, leveling up, and unraveling another charmingly strange plot in the world of Adventure Time. This turn-based combat plays really well in every way except that it's very easy. It seems simple by design, like your characters will always be just a bit better than the enemies you'll encounter, thus it makes almost any interaction a breeze. A few bosses will give you a bit more of a run for your dosh, but even they are easily thwarted if you're at all familiar with the way turn-based RPGs demand smart item usage. There are plenty of status effects, special attacks, and other small but expected nuances present in the combat system, so it's not that the whole experience is void of any intricacy — it's just all tried and true design made with fewer obstacles in the way, and that's a great thing as the series and this game are both primarily marketed to kids. For them, it'll feel something like Baby's First Turn-Based RPG. Sadly this design leaves out in the cold the many adult fans the show has garnered over the years as well. For them, the combat will provide so little challenge that it risks becoming a bore. Even as the combat is so easy, it remains fun to level up your party and watch as their abilities and stats grow. This is a feeling with which genre fans are surely familiar, and it works really well here yet again. One aspect that doesn't work nearly as well is the interrogation aspect of the game. Sometimes you'll need to get the upper hand over someone using your words rather than swords and fists, and in such cases, you interrogate them as Finn and Jake. Their banter always reveals which approach you should take on the binary good cop-bad cop spectrum that's offered, and these moments are over so quickly and feel so out of place that it's a mystery why they were involved. It feels as though they're a thrown together homage to a different game in the genre and maybe I'm just missing the nod. It's hard to justify their inclusion at all. The game suffers from a few technical problems, like occasional framerate drops, but mostly in the way of desynchronized audio and video for cutscenes, which manifested in the voicework beginning a moment after the video and meant speaking lines would get cut off often in cutscenes as the audio failed time after time to catch up to the imagery. Still, if you enjoy Adventure Time enough to forgive those problems, what remains is plenty of fun and definitely worthy of the license. Characters are constantly funny, from main characters to one-off enemy NPCs. The full voice cast from the show once again returns as they seem to do for these games each time out. They'll perform shanties while crossing the makeshift oceans of Ooo, and you can even go to war with other pirates at sea, although these engagements still turn into more of the same turn-based combat and not naval battles. It's a fun and definitely fitting storyline and aesthetic with a few silly twists and plenty of humor that feels like it's right out of the TV series. Although the show's 2D art is not utilized, this is otherwise the most faithfully visualized game in the series. The colors, textures, and models of most everything are just about exactly right, and the only difference between the game and TV show is how it's all in 3D in Pirates of the Enchiridion. A totally faithful depiction of the show in game form would be fantastic, but as it is, Pirates mostly looks like the real thing and in the ways it's different, it's still great. The achievement list isn't as easy as that from the last game in the franchise but it still won't take you very long to finish. You'll get several just for beating the story and a few more for getting each character to level 10, which actually won't come so easily unless you do nearly all the side missions. You'll also need to watch out for a few secret achievements that can be easily missed, but the size of the open world and the length of the campaign means it won't take most people more than 10 hours or so to finish it off. The game warns you of a point of no return for the final sequence, but you can reload your save after that and go right back to where you were to polish off the remaining objectives. The reviewer spent six to seven hours in the land of Ooo, waiting for his turn to beat up pirates and other ne'er-do-wells. He gathered 24 of 36 achievements for 560 gamerscore. An Xbox One review copy was provided by the publisher.